Sept 21st has been long held as International Peace Day, and so it was appropriate that Wayne Ostlund’s memorial was held on this day as he had long championed peace and challenged America’s role in subversion and war activities abroad. 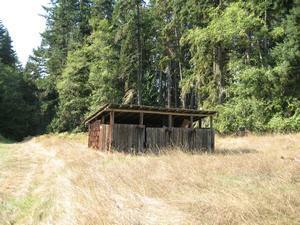 Clallam County in WA was long known as having the largest John Birch membership per capita in the state. It was also the last day of a beautiful summer and the next morning I woke up to autumnal rains. I first ran into Wayne in the Reagan years and his letters to the editor and the now – revealed papers probably held some sort of record. Those letters influenced a great many, explaining the hundred plus celebrants of his life. It also created 2 A.M phone calls for the family that suggested he move to Russia. The same would happen to me later but all I got was why don’t you move the %#)+ out of the country. Brief words can never describe the influence that a person or family can have on another. Wayne was not just an influence on the political front but was always there to lend a hand if needed. Lee and Wayne were generous to strays … people who had lost their traction in this world and it is for that generosity I remember them. Missed even more after the memorial which was GRAND and amazingly attended! “Sweet Chariots” do indeed await you. Public input is all but moot at this point as the Murdocracy of ‘News’ totally smothers such editorials even by staff. When they do they run the risk of losing their jobs, pensions and are often viciously attacked by other news staff wishing to ascend. This is an Orwellian world indeed, and at present ALL our local newspapers are owned by one Canadian company and would not print anything Wayne would have said or material provided by myself. On his deathbed Wayne kept thinking and writing down his opinions and knowing he could not finish his last piece in 2014 he gave it to his new partner to finish. I think she did a great job and it runs to three pages and is about ‘An alternative to history” Like my own writing it needs Kaopectate. By the way he was in his 90’s when he hooked up with this former friend. This segue brings me to the memorial itself and how this new partner of his, bravely informed everyone that she was not some hussy moving in on this guy and went into their funny re-encounter at a local store. It was a powerful and wonderful remembrance of her time with Wayne and left most of us with tears in our eyes. Mind you she followed some powerful stuff from his two wonderful daughters Karen and Susi – and Karen’s husband Steve. Their two grandchildren were also with Wayne during his last days and both made moving statements. Ryan began with a moving poem upon his granddad and Kristin who had salvaged all of his letters to the editor and recompiled them to publish in a readable publication. These two were of the ‘Millennium’ generation, but I know that both learned much from this man who was of the ‘Great’ generation. I pray that Kristin also recovers some of the poetry and stories that Lee had written. I would add that Wayne left behind his wine recipe. After the family spoke, so did others including Sister Kathleen who gave a Peace convocation and called Wayne a ‘Prophet of hope,’ not something I would agree with but he was neither a pessimist nor an optimist. He simply gathered information, collated it into a presentation and provided that commentary to the newspaper and other fortunate ears. 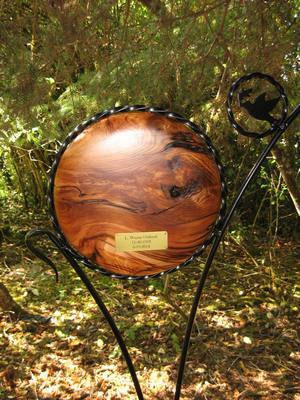 Sonny, Wayne’s son in law, made two wonderful memorial markers that stood above the resting places of Lee and Wayne’s ashes. Appropriately placed in a grove of Engelmann Spruce and not too strangely it was the first place I went to. Karen had always had believed that ‘Ostlund,’ meant East land in Norwegian or Swedish but the origin of the name actually meant ‘One who came from the east grove. lund ‘grove So considering the family name and the environmental and future land trust uses of this property this planting was beautifully done. The Chinook Blessing anchored this memorial. Having neglected visiting Wayne for so many years made me re investigate the property that had at one time been like a second home to me. The first place that drew me in was that grove where I sat down on reflected on those two markers. I then ventured out to visit the old barn, the pond where we had all gone skinny dipping and all the other places forever stitched into my memory. 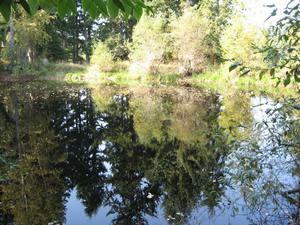 The pond is now surrounded by well-made Wood duck home sites. Wayne and Lee had moved to this wonderful refuge after their home on Black Diamond Rd. had burned down. ‘Skull Rd.’ for the amount of cattle skulls that were to be found. Another story, but when they arrived at this place it was a hard scrabble time. 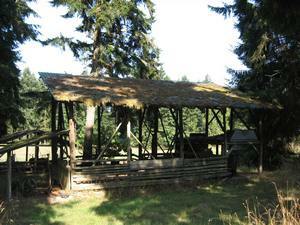 The only structures were the old barn, an outhouse, well house and a storage site that I still have no explanation for. Wayne had worked for the local Railroad and was a pack rat scavenger of surplus from the lumber mills as well. In so doing he managed to construct a living home that sometimes … well had a few glitches as his son-in-laws would find out in their many upgrades and repairs. “WHY did you use this?” Well, it was all I had at the moment, might have been the answer. Both Steve and others sometimes ‘tidied’ up his shop only to find that such efforts were not appreciated. Somehow, in all the disorder Wayne could identify to the drawer and the bolt or number of screws that held within. Cleanup efforts by family or friends simply mucked things up. It was one hell of a turnout to deal with. Many old souls I have not seen for over twenty years. The grand kids I used to play with are now adults – and they were with their granddad as he slowly chose to leave this plane of existence. Somewhat of a Jack London ending to his life. Three pages long and dictated to his new partner Pam. I so wish there were more people like Wayne. At 95 and dying he wrote and dictated his final article to his ‘hussy’ I so love. I knew her and her husband (passed on) from long ago. This woman finished it off for him as he knew his time had run out. Three pages and these words are his last two paragraphs. “While the Japanese and most Europeans have had their appetite for war and conquest well and thoroughly kicked out of them, there remains a frighteningly large number of Americans who somehow believe that we are the victims, not the perpetrators of most of the evil and violence in the world. Our nation, once the most respected and admired in the world, has now become the most feared and hated. We need more people like Wayne, even though he was not a Harbinger of Hope. NOPE! And BTW I totally disagree with the rest of the article. This was an old argument of ours between Henry Wallace and Harry Truman. OR perhaps a reminder that even good disagreements need a Thank You! I am still having trouble with my emotions after yesterday. I knew both very well and Wayne became my foster father so to speak. Lee was my Mothers best friend and supported her through her brief life in Sequim. I miss them so much and feel a lot of guilt for things I coulda – shoulda done better in his last years. So glad he got a great gal to finish off his last ‘letter to the editor.’ He knew he could not finish it, dictated what he could and Pam polished it off. His ‘Millennial’ grand kids were grand in what they did for him. Sadly few have put in their comments in a nice obituary memorial and for a sponsorship fee they will keep it running for another year. My own finances and disability disallow that option, but if someone has something to add, please do so. It is a 30.00 a year sponsorship that I know someone can afford. Please add your own pictures and stories. Wayne would appreciate such written wordage. My own guest book entry: Brief words can never describe the influence that a person or family can have on another. 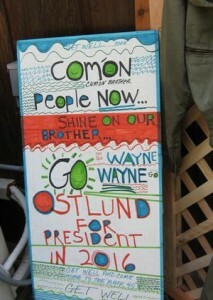 Wayne was not just an influence on the political front but was always there to lend a hand if needed. Both Lee and Wayne were generous to strays … people who had lost their traction and it is for that generosity that I remember them. Missed even more after the memorial which was GRAND and amazingly attended! “Sweet Chariots” do indeed await you. So does Kate Wolf. 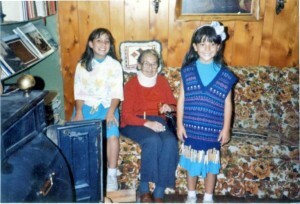 The picture I include is of my Mom who was dying and my two daughters who learned from Lee and Wayne. Lee may have been lifted through the Pearly gates by faith alone, but Wayne would have needed a boost by Pete Seeger, Carl Sagan and Linus Pauling. Once asked: ” Dr Pauling, how do you have so many good ideas? ]” Well, I have a lot of ideas and throw away the bad ones.” Something some of us forget to work on. Like Linus Pauling Wayne was a man with a fantastic memory, and a great presenter of ideas. I think he was Clallam counties greatest gadfly and like Linus it took a lot to change his mind. No doubt about that! I would emphasize the fact that they raised two incredible daughters in Port Angeles. “His love for the Olympic Peninsula extended from hiking to kayaking, mountain climbing and backpacking (which he introduced to his daughters from the time they were 3 and 5 years old).” Susi had something to say about his hiking speed and my own experience with Wayne was the same. 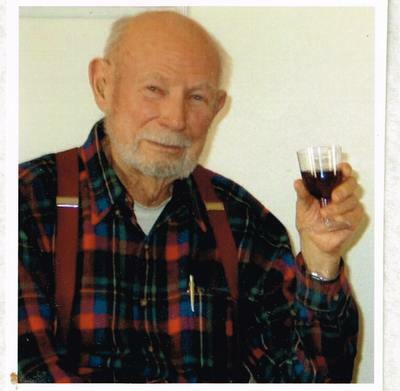 “Wayne lived independently on the Ostlund’s 40-acre farm on Blue Mountain Road until his death. The family had donated the land’s development rights to the North Olympic Land Trust to protect it as a refuge for the many species of plants and animals that exist there.” I would add that I saw my first cougar on that property running across the meadow below. No Recipe – but a story follows! Halfway down the page. Back to Politics: “Who can I trust now?” – I am still asking that question. The only thing I would add being that we often rely upon believing and supporting people we ought not to. Even in the best circumstances, you are riding atop someone else’s shoulders. Wayne would be the first to say – GET OFF! With all that faces us, we need to become our own watchdogs – rant and rave all you want … but be effective. That needs political and social involvement. ‘Trusting’ was never in my favorite category or words when it came to government. I will at a later date do more about some of his funny stories. Oysters, mole killing, the infamous chicken manure episode. Wayne’s killer wine recipe! Karen’s poetry ending by Jack London which was so apropos to the ceremony. Same for her sons poem on his Grand dad. More should be added to his achievements. How Lee and Wayne met in Alaska, moved to Seattle (in one of the coldest days ever recorded gave a birthing to …. was it Susi or Karen?. Moved to P.A. and then to this 40 acre property that will be an oasis and refuge to all the wildlife that finds a home here and thanks to their planning will continue to thrive. Wayne’s story about me being lard … Fifteen years ago and somehow this became a precursor comment on my eating and becoming lardy. With those lighter ended notes I will end my story and know that Wayne will always be in by heart if not in my veins. The music if you missed the link above was Kate Wolf ‘The Apple and the Lilac Tree.’ She left this world far before her time!